Wave (2) has reached our minimum target projection, however there is some question in my mind as to whether that was ALL OF wave (2), or only wave a of (2) up with b-down unfolding now. The possibility exists that my labeling of the bottom as "b" is incorrect, since that cluster of waves is very difficult to count cleanly. If the (1) label were moved over to where the "b" label is currently: then we completed a-up of (2) today, and now are in b-down, with the larger c-up of (2) still to come. This alternate possibility is represented by the gray dashed line. 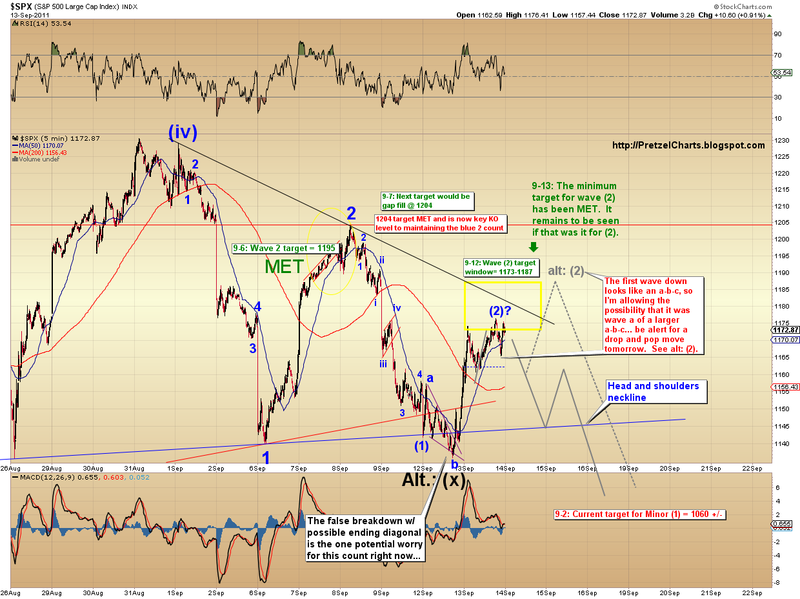 If the alternate were to play out, I would watch for a "drop and pop" move tomorrow. Beyond that, a break below the (b) wave low will likely indicate wave (3) is underway, and at that point we should see the selling intensify -- although I'd be surprised if that break happened tomorrow. Trade safe!